When reading an especially good book, sometimes I wonder if I’m under a spell: that the story won’t hold up to the joy of its wonderful writing. As I reach the final chapters, anxiety builds that upon finishing the book, I will see through the prose and find my happiness was nothing but literary lust. Readers: consume this book without fear! Erika Swyler has given us a gift of magical realism that we will cherish through multiple readings. Buy more than one copy, as you will give this to your siblings, your friends, your coworkers, and they will be loath to give it back. The story itself is hard to describe, but at the center are a brother and sister and their struggle with normal family and life problems that have only been complicated by a subtle strand of magic. Readers of The 13th Tale and Water for Elephants will make a home for The Book of Speculation on their bedside tables. It’s difficult to find an instructional book for a knitter who is just beyond a beginner but well short of advanced, so I was delighted to find Increase, Decrease to be the perfect book for understanding the mechanics of knitting! The simple instructions, step-by-step photos and just overall thoughtfulness of this guide has opened my eyes to projects I never would have attempted. Now I feel I understand the secret language of patterns, and why one technique would be used in preference to another. This is an ideal book for knitters (like me) who need to understand the details before they can grasp the bigger picture. If you’ve ever looked at a pattern and said “But WHY?”, then Increase, Decrease is the instructional tome you’ve been waiting for. Die a violent death and maybe you’ll become a strange immortal entity, able to take any body as your own, any life becomes your playground. Want to be a prince? A movie star? Simply get within touching distance and you are. Be admired by many, adored by millions, or just choose a family and be deeply loved by a few. Of course, it isn’t you they love or admire, but the body you stole. There were some passages in ‘Touch’ that left me gasping for air as I followed the narrator through his/her/his/his/her escape in the most fascinating cat-and-mouse chases I’ve ever read. Characters had multiple dimensions, deepened by the fluid gender of the “ghosts” as they flitted from body to body. I was surprised at the deeper questions wrapped in the beautiful storytelling and thrilling action. No matter who we are, or rather what we are, we all must consider what it means to be loved, and what we would attempt to achieve it. I was worried it would be difficult to objectively review a book by an author I admire beyond his fiction writing, but as soon as I opened John Scalzi’s Lock In, worries gave way to fascinated enjoyment. I knew I was in for a good time when I slowed my usual mile-a-minute reading pace so that I could absorb the humor and details. We are introduced to a near-future world through the eyes Chris Shane, or rather the vision sensors of a”threep”, Shane’s robotic body used in the real world. Shane is a spanking-new FBI agent and medically locked-in victim of a disease that swept the world a couple decades before. Partnered with a rough-around-the-edges agent Leslie Vann, Shane quickly discovers that casework can hit close to home. Scalzi does a great job delicately world-building (world-tweaking?) around a gritty and suspenseful mystery. Lock In will surely appeal to both SciFi and thriller readers, or anyone looking for a fast-paced story. How many heartbreaks can a reader endure in the span of one book? Meg Wolitzer apparently tries to find out in her beautiful new YA novel Belzhar, due in bookstores at the end of September. Jam Gallahue has no idea how lucky she and the four other students are to be in her Special Topics in English class. Nothing in life has seemed luck since the loss of her wonderful British boyfriend, followed by isolating depression and finally enrollment in a therapeutic boarding school. Compared to her grief, nothing seems particularly special about a class that emphasizes journal writing while studying The Bell Jar. What Jam and her classmates soon discover is how …transporting writing in these specific journals can be. Each teen has a story of loss that brought them to the school, but leaving their individual traumas behind might be more dangerous and, yes, more heartbreaking than you could ever imagine. Read this book. It isn’t the “Woe is me, I’m an angsty teenager” YA novel that you are used to. If you are the kind of person who cries at Humane Society commercials, invest in a box of tissues first. Update: Total failures on some, huh? I only bought two new hammocks, though. Let’s see how I do in my thirties. This got me miffed. You can take away the free checked bags, tissue-thin blankets, tiny pillows, snacks, leg room, arm room, and head room. You can force me to pack all my belongings into a carry-on, take my shoes off, get a microwave scan and DNA swab. But if you serve me Decaf coffee, all bets are off. Dry heat is one thing, but I was also dehydrated, which is a horrible combination. Don’t hate on Arizona: Hydrate yourself. …they make me all weepy. The band applauds their biggest (well, big for her age) fan. This is a livefeed of a drop of pitch expected to fall any day now. This is kind of exciting because pitch is a fluid that moves so slowly, there have only been 8 drops since the physicists at Queensland University started this experiment 80 years ago. Because the drops are so rare, no one has witnessed one. Now thanks to the power of video and the interwebs, think of this blob as the slowest lava lamp you’ve ever watched, with thousands of your furthest friends. Please excuse the pun in the title, but the Columbus Crew scoreboard caught fire. We can all agree that Ohio’s professional teams are cursed, right? I mean, where does this even fall on a scale of one to LeBron? As a Sporting KC fan, I’m allowed to be amused because no one was injured. I’m also amused because they have an advertisement for a shaving cream that leaves legs incredibly dry after use. Seriously, just use baby oil or conditioner. Call me selfish, but at least a few hours of my life will be significantly dampened if the Red Wings miss the playoffs for the first time I can remember. This is the one sport in which I’ve lived a charmed life, free of the pitying looks that accompanied the 90’s Tigers, Lions and Fighting Irish. 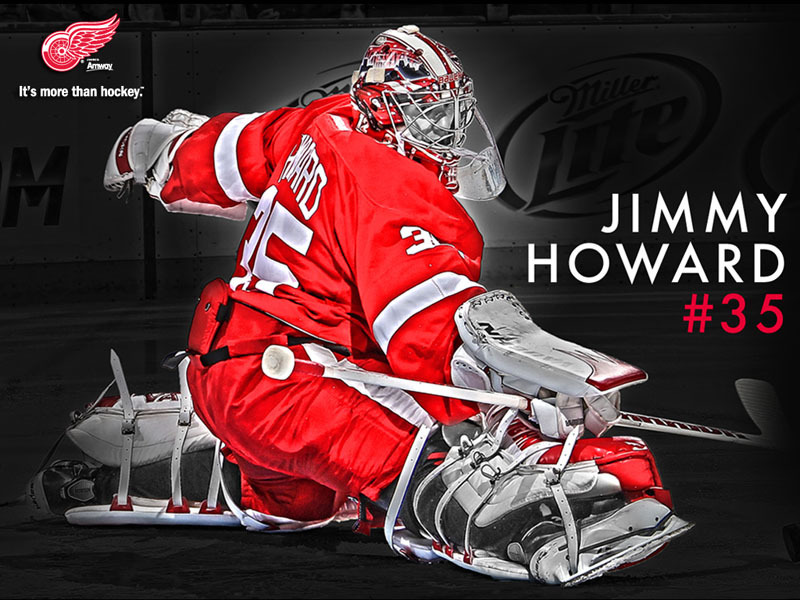 The Red Wings play in Hockeytown, for crying out loud. Don’t let them take that away like they took away the College Hall of Fame from South Bend. It all comes down to tonight’s game versus the no-hope Dallas Stars. Jimmy must be perfect, and our aging stars need to take their arthritis meds and (oh God don’t say it) out-shine the Stars. Once we’ve made the playoffs and Detroit’s reputation stays intact, then we’ll figure out how to inject some vitality into the AARP -bound Wings. subject:Your order has been shipped! I’ve bolded books read, italicized books not completed. I was a runner once. People who know this always expect me to be good at running. It isn’t the same as learning to whistle or tie your shoes, you can’t just go back to 6:45 mile splits after years of laziness. I hadn’t even bought new running shoes in the three years prior to last month. Blah, blah, blah. 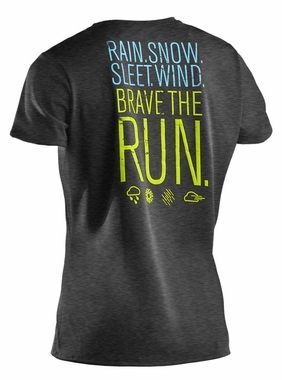 I want this shirt ($25), but only after I’ve started running again. I’ve already promised to start running, because that’s how I justified buying the shoes. This time I will also do my best not to injure myself in the first month. Once I get back into the routine of running, I usually try to add on miles too quickly and end up with shin splints or Morton’s Neuroma. Then I stop running for six months or so. Not this time. I am going to Brave the Run, and hopefully be wearing this shirt at a 5K by September. Don’t know if you noticed, but the FIFA Women’s World Cup Finals began over the weekend. The US team has a great chance of advancing pretty far, which is a welcome reason to celebrate after the disappointing loss of the USMNT at the Gold Cup. An unfortunate thing I realized as I dressed to go to the Gold Cup game-watch: I don’t own any USA gear. No flag shirts, scarves, or hats of any kind. None of my clothing even combines the right colors of red, white and blue with the exception of a Guinness sweatshirt, which seemed to defeat the point. I have gear for Ireland, Brazil, the Red Wings, Tigers, Notre Dame, Kentucky and even Manchester City, but nothing for the US of A. I had a settle on a blue *gasp* dress. It obviously brought no luck to our boys, so I’ve decided it’s high time I gave our country its own spot in my closet. I’m a big fan of the current USMNT third kit (red! 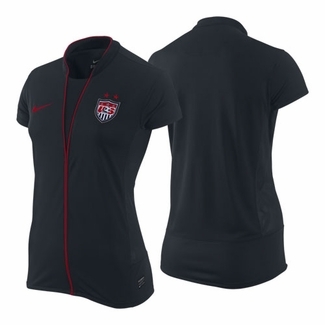 $70), but today the Dirty Tackle blog pointed out the unusual design of the 2011 Women’s kit. They suggest it looks like a nurse’s uniform, but I think it looks comfortable. 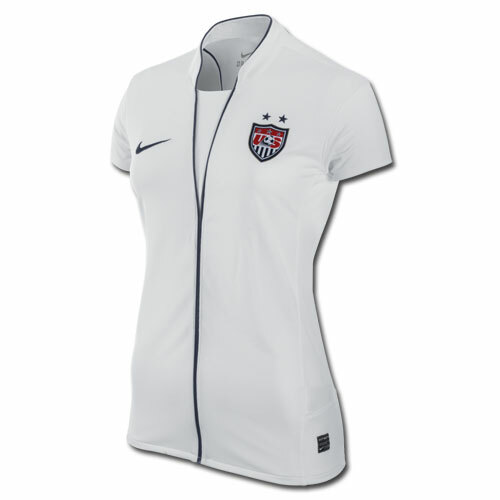 I’d probably get the Away Jersey ($80), if for no other reason than I’d spill on the white with my first beer. …it is impossible to develop cavities in the absence of fermentable carbohydrates. Wow! I love the word “impossible” when used somewhat scientifically. To answer the original question, sugar-in-the-raw, or natural brown sugar, is made by not extracting as much molasses while refining. 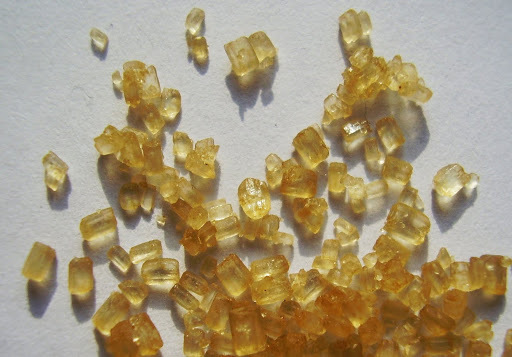 It is produced during the first crystallization of the sugarcane, while white sugar, or table sugar, is produced after the third boiling and crystallization. Natural brown sugar is different from the brown sugar we bake with, which is white sugar with molasses blended back in. Things to say while raising a glass: Cheers! I knew a few of them, but am always happy to learn more.